If you often download and install freeware on your computer, it is very likely that sooner or later you will install such adware application as Ttessab on your computer. 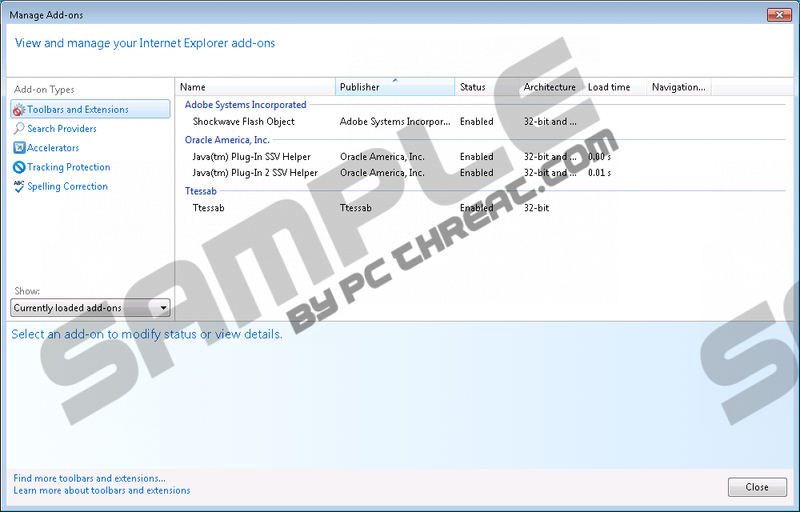 This adware program gets installed on the PC as a browser plug-in, and officially the application is supposed to improve your web search experience. However, the fact that the download link at the official website does not work should be your first alarm when it comes to Ttessab’s security and reliability. This application is not as safe as it might seem so the sooner you remove Ttessab from the PC the better. The adware application belongs to SuperWeb family of adware programs that are usually distributed bundled with freeware. Ttessab is practically the same as Laflurla, Cling Clang or Surftastic adware applications. All of them are compatible with Google Chrome, Mozilla Firefox and Internet Explorer web browsers. They add an entry in the list of installed programs on Control Panel, and consequently it means that you can uninstall Ttessab yourself. However, the fact that the application comes together with various other potentially unwanted applications shows that you cannot just leave it there – you should scan the system with SpyHunter free scanner to determine what other programs should be removed from your computer. If you do not uninstall Ttessab, whenever you access the Internet the application will display various pop-ups that will offer you to play online games, install new flash player updates and what not. The adware is provided via fra1.ib.adnxs.com server, and although it may seem that Ttessab displays those ads in order to provide you with useful content, the problem is that the application does not REVIEW the ads content. You may be exposed to a variety of commercial and even potentially harmful content via Ttessab unwittingly. Naturally, infecting you with malware is not the main purpose of Ttessab. If anything, adware applications are created to generate financial profit to their creators and the people who use them, so although Ttessab is slightly shady, it is not a malicious computer infection. Nevertheless, the application could be exploited by malevolent third parties for malware distribution, and that is a possibility you always have to keep in mind when you encounter pop-up ads on the Internet. Although the chance of getting infected with malware is not too high, it would still be a good idea to remove Ttessab from your computer. Delete all the other related applications while you are at it, and invest in a powerful computer security application to safeguard the system from potential threats. Slide mouse cursor to the bottom right of your desktop. Open Uninstall a program and remove Ttessab. Go to Uninstall a program and remove Ttessab. Click Start menu button and navigate to Control Panel. Access Add or remove programs and uninstall Ttessab. For more information on Ttessab or computer security, do not hesitate to leave us a question in the comment box below. Quick & tested solution for Ttessab removal.